The "Stalker" (Alexander Kaidanovsky) works in some unclear area in the indefinite future as a guide who leads people through the "Zone", a vicinity in which the normal laws of reality no longer fully apply. The Zone contains a place called the "Room", said to grant the wishes of anyone who steps inside. The area containing the Zone is sealed off by the government and great hazards exist within it. 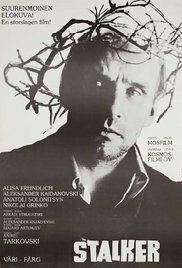 At home with his wife and daughter, the Stalker's wife (Alisa Freindlich) begs him not to go into the Zone but he ignores her pleas. In a rundown bar, the Stalker meets his next clients for a trip into the Zone. The "Writer" (Anatoly Solonitsyn) and the "Professor" (Nikolai Grinko) agree to put their fates into the hands of the Stalker. Their specific names do not come up as they all agree to refer to each other pseudo-anonymously by just their professions. Read more on Wikipedia.